Keeping smiles whole and healthy from day one is always our top priority. We work with patients of all ages at our practice, and take an airway focused approach to dentistry. That doesn’t necessarily mean we only care that patients can breathe deeply and unobstructed (though that matters). Airway focused dentistry is about considering the overall impact of every treatment plan on the proper and ideal development of the airway. 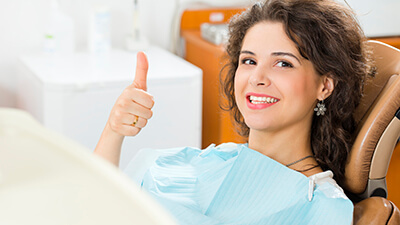 If you’re ready to find out more about our unique treatment philosophy or schedule a preventive dental checkup, contact our knowledgeable team today. Next, our skilled dental hygienist carefully removes plaque and tartar buildup from even the most difficult to access parts of patients’ teeth, leaving patients with perfectly clean smiles. Finally, Dr. Campbell or Dr. Schmidt sit down with patients to discuss findings and partner with them to create an ongoing care plan that meets their needs and helps them achieve and maintain the optimal level of oral health for a lifetime. As a family dental practice, we welcome patients of all ages. That includes patients as early as one year of age. Our unique, airway focused approach to dentistry is important for our younger patients. Research shows that early diagnosis and intervention to correct airway obstruction and bite alignment can help young patients lead healthier, longer lives. In many cases, we can stop common concerns such as TMJ dysfunction and sleep apnea before they ever begin. In addition to our unique treatment philosophy, our dentists have years of experience working with young patients, and we offer a number of services specifically geared toward younger patients including fluoride treatments and mouthguards for young athletes. Unconscious teeth grinding and clenching, bruxism, most often occurs while patients are sleeping, making this habit tough to break. However, we offer a simple, comfortable solution – nightguards. These guards allow the bite to rest in its ideal position for maximum comfort and less teeth grinding. Additionally, the nightguard places a physical barrier between the teeth preventing potential wear and damage that may occur due to grinding and clenching. Best of all, these appliances are completely comfortable, allowing patients to speak and breathe without obstruction throughout the night. 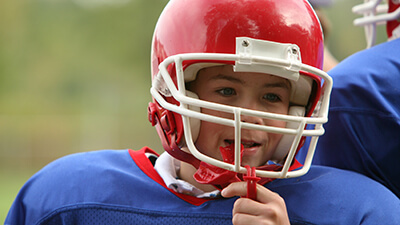 Patients who take part in any sport where their smiles may come in contact with other patients, hard surfaces, or sports equipment, should always wear an athletic mouthguard. Sometimes referred to as a sportsguard, these customized athletic guards protect patients’ teeth from being damaged during traumatic impact. Sports-related injuries are the leading cause of tooth loss for patients under the age of 25, and it’s our goal to help prevent these lost teeth whenever possible. According to the Oral Cancer Foundation, early diagnosis and treatment is the best way to reduce the number of oral cancer related deaths (about 1 every hour in the US alone). That’s why screening for oral cancer is an essential part of every six month checkup at Campbell & Schmidt Cosmetic & Family Dentistry. Whether patients engage in high risk behaviors such as tobacco use, we complete an oral cancer screening with the Velscope system, during every checkup. Developing dental structures need ingested fluoride in order to form strong, durable teeth, but once a tooth erupts from the gum line, topical fluoride is necessary to improve the strength of enamel. 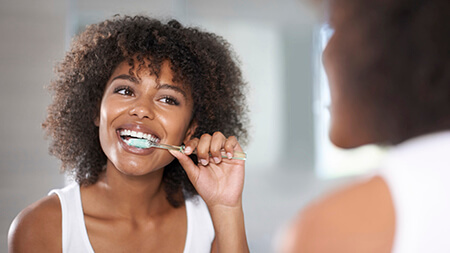 For most patients, fluoride in toothpaste and mouthwash used on a daily basis is adequate, but for younger patients still developing their oral hygiene skills and adults who are prone to decay, professional fluoride treatments may be necessary. We can apply this professional-grade fluoride treatment as part of any dental checkup and teeth cleaning. Another way our dedicated team is able to assist patients in keeping their smiles whole and healthy for life is by offering product recommendations. We recommend a number of different products based on patient needs. 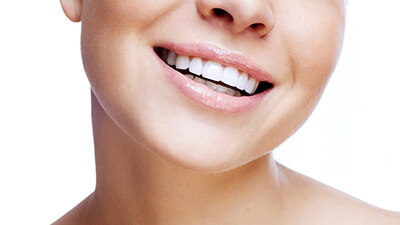 We frequently recommend Pronamel products as a great starting point to protect teeth and strengthen tooth enamel. For those patients who experience frequent decay, weak spots in their teeth, or who are at high risk for gum disease, we may recommend more advanced products from the Enamelon and CloSYS lines.